I have been browsing a Lutheran church book for the town of Wetter, Marburg-Biedenkopf, Hesse in Germany that details 18th century birth and marriage records, and am trying to establish a link between a known Anna Maria Henckel and her parents and grandparents. I think this is pretty clear. On the 11th November 1774, Johannes Marth, son of Daniel Marth, and Annia Maria Henckel, young daughter of Johann Jost Henckel, were married (in Wetter). 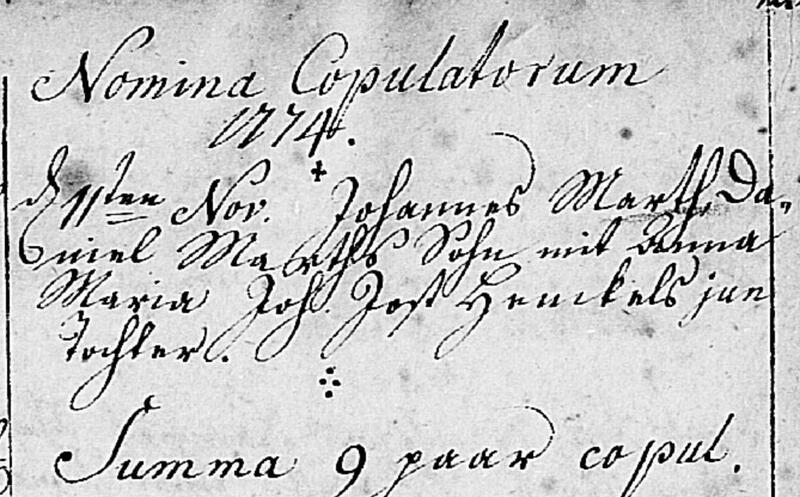 Now, there was only one Anna Maria Henckel with a baptismal record (23 April 1754) in the church book for this town in the previous 40 or so years, and the father's name matches, so I conclude this must be the right person. Here I have my first problem. The leftmost column is for parents (usually just the father), the middle for the name of the baptised child, and the rightmost for the godparents/sponsors. The father is clearly Johann Jost Henckel, but I can't make out what the word(s) below his name, although I would guess it starts with "von", and indicates either the town in which he was born or lived at the time. The column for godparents (patrini in Latin) is pretty clear, and translates as: Anna Maria, Wilhelm Schmitt's daughter from Kirchhain (a nearby town). This is not the clearest, even for Gothic handwriting, but here's my attempt at a transcription, with some abbreviations expanded to the best of my knowledge. Montag d (der) 23 April T (Tag) ist Joh. Jost Schmidt ein(e) Tochter getauft hat gehaben das Kind als/alt Mutter Johannes ?? ?els Frau ih?? ????????? v. (von) Kirchhain Joh. Wilhelm Schmitts Tochter und ist das Kind Anna Maria genannt(?). Now, here is a possible marriage record for Johann Jost Henckel and his wife, Anna Maria's parents, dating to 22 Jan 1751. My reading of the town name as "Oberrosphe" is very unsure, but I know this is a name of a nearby town. A big problem is that this town name doesn't seem to agree with the one in the above image (birth record for Anna Maria). Likewise, the name of Anna Catharina's father is quite tentative. I've made three surname suggestions based on other individuals I've seen in the records (and expecting them to be in genitive case). So, can anyone help me with deciphering / translating / generally making sense of the above? I'm really not sure if I've established the right connection here, or am going up a blind alley. Thanks in advance. Montag d[en] 23t[en] April ist Joh. Jost Schmidt eine Tochter getauft[,] hat gehoben[?] das Kind als Mutter Johannes Zekels[?] Frau vor ihre Schwester v[on] Kirchhain Joh. Wilhelm Schmitts Tochter und ist das Kind Anna Maria genan[n]t.
I'm interpreting this as the baby's aunt took the role of the mother at the baptism. The mother may still been incapacitated by the birth. I can't explain this, may be unique to this region; can only recommend checking the record collection descriptions and, perhaps, regional research pages for Hesse. these all look to be the same family/individuals, but only looking at the whole community will reassure you as to the uniqueness of the name combinations. Deciphering the placename in the 2nd image is complicated by the descender from the previous line and the smudges. It might start with E but that's a guess from too small a sample. I would increase the size of that part of the image, break the word into (probable) letters and match each with known letter forms from elsewhere on the same page or nearby pages. For examples, see Did the spelling of this surname change or is it misread? and What is this first name for Gregorčič witness to marriage?. I would also check German gazetteers for candidate placenames. Be creative with spelling. Check for older versions of the placename. Since the record has only 1 word (no Kreis or region), the place was somewhere nearby. Not the answer you're looking for? Browse other questions tagged birth-records marriage-records church-records german-language hesse or ask your own question. What is this first name for Gregorčič witness to marriage? Did the spelling of this surname change or is it misread? Looking for 1901 birth/baptismal certificate in Poland? 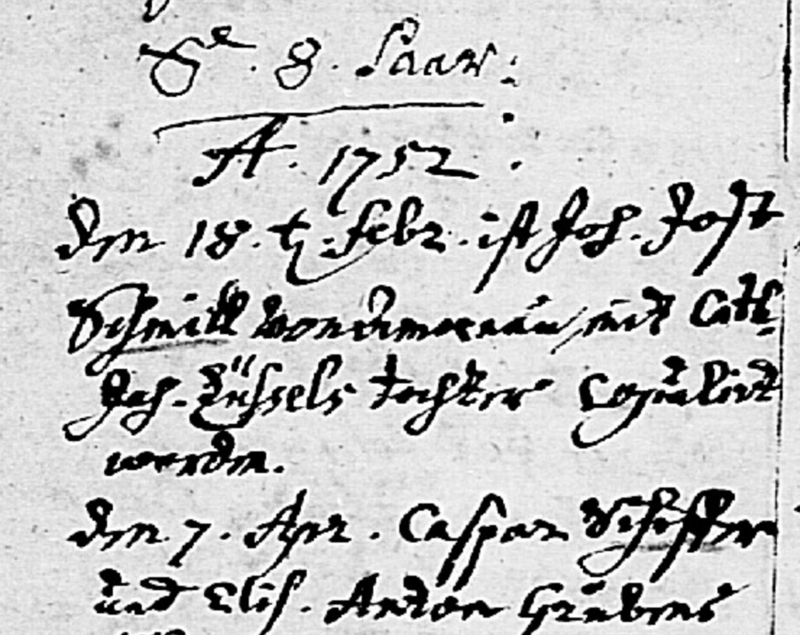 Interpreting 17th century German church record? Finding out what church a 19th century English family belonged to? 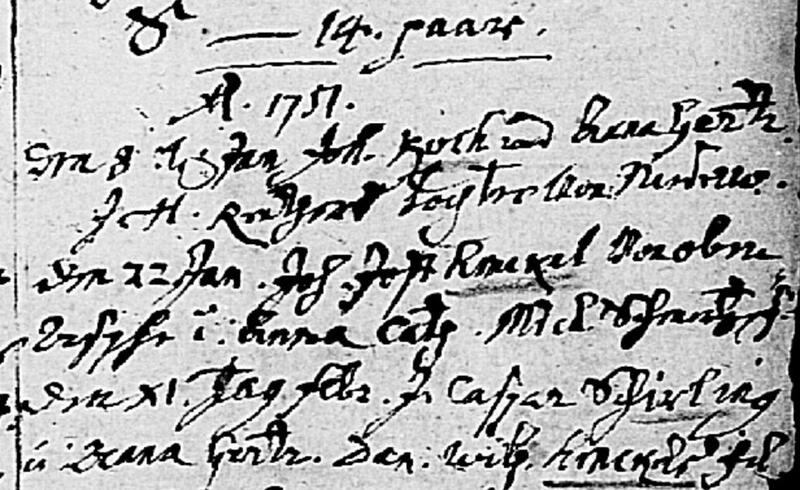 Interpreting (yet another) 17th century German church record? 1890s birth for Anna Hunkalo in Lwów?